In most ActivLayr application scenarios, follow these simple steps. The white ActivLayr collagen nanofibre will absorb upon contact with moistened skin. Step 2: Remove protective backing. Be careful not to touch the white ActivLayr collagen nanofibre as it will easily absorb into fingertips if they are wet. Step 3: Apply patches firmly. 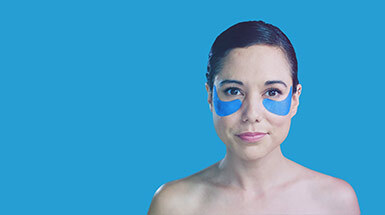 Ensure the whole patch makes contact with the desired area of skin. You should see and feel the patch wet out. Step 4: Wait 5 seconds. 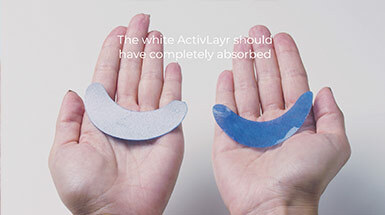 While ActivLayr absorbs instantly, we recommend waiting at least 5 seconds to ensure full absorption. Step 6: Dab any remaining residue. With damp hands or a cloth, dab any remaining residue until it has fully absorbed. Note: Ensure patch fully wets out. 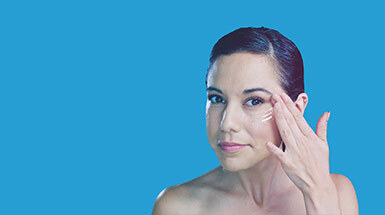 The white ActivLayr collagen nanofibre will dissolve completely upon contact with wet skin. Make sure you see the patch wet out completely. Note: White ActivLayr should have completely absorbed. Make sure you use all the ActivLayr on the patch. If there is any left, press it to wet skin again until it has fully absorbed.